HomeBeauty ArticlesWhat are Blended Brows™? Blended Brows™ are a 3D-3 layer semi-permanent infusion of micro hair stroking and shading techniques. Using various colors and needle configurations results in beautifully restored and natural looking eyebrows. What Blended Brows™ are not: a one-way cookie cutter approach to brows. 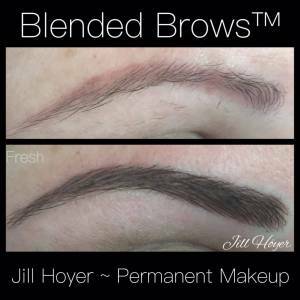 Jill Höyer has over 15 years of innovative experience in Permanent Makeup. “I love permanent makeup and the advances we have made over the years. Combining my experience and techniques both manually and by machine, I bring to my clients Blended Brows™”. Hair Stroke techniques may be created with microblading type needles (manually done by dragging needles to create a cut) or by machine using nanoneedles (very fine needles) for micro fine hair strokes without a cut. Hair stroke is a technique used to simulate hair and it adds a dimensional quality to the brows. You may have the hair stroke technique done on its own if you have hair to hide the tattooed strokes, otherwise, the simulated hair strokes look better with added shading techniques to blend in and hide the visible strokes. As you read I further explain the various hair stroke methods. Hair Strokes by Microblading: By manually dragging needles through the skin a cut is created and ink rubbed into the open wound. As the wound heals pigment is trapped in the hair stroke shaped slice. Due to color fading usually 2-3 visits are required which means more cutting with each visit. With common sense and a skin care background- the repeated cuts don’t make good future ‘skin sense’. I ask myself, how many times can the brow endure cutting over the next 5-10 years as clients require maintenance visits? This if often disregarded as microblading has celebrity status because of how it looks so hair like in the immediately after photos we see on social media today. Healed photos must be represented in an artist portfolio because the look will change. I feel I must take the time to explain to my clients the technical details as some people don’t realize what microblading is and they aren’t ok with the cut aspect,- and the canvas of their skin may not even be a good platform for the technique and that’s for me to decide. If you indeed want this technique and your skin is a good canvas to work, on I will let you know. My extensive private training in Singapore long ago gave me a great microblading lead but I know this one- way technique is just one tool in my toolbox of “Blended Brow™” techniques. If you don’t want the cutting but want the results, don’t fret, there are other ways to achieve realistic hair stroke effects. Competition creates better products. Because of microblading and the fine needles and strokes it creates, our machine needle manufacturers have stepped up to the plate. We now have nano size needles which create micro hair stroke effects by machine without “cutting”. In the past the diameter of the single needles we used in the machines weren’t the quality we have today. The nano needle’s diameter are extremely fine creating micro fine lines. This is exciting for artists who know how to use these delicate needles! Hair Strokes by Machine: I start by dipping the “nano” needle into pigment, then I draw the stroke on the skin. The needle is moving up and down delivering pigment under the skin as I draw. There is no open cut or slice in the skin. This hair stroke machine technique looks like the microblading strokes. From a photo, clients actually don’t know the difference. They just know they want hair stroke effects. It general machine work is harder to master the over microblading techniques and this is one reason why there are so many overnight microbladers taking quick classes resulting in less than desired work. (Unfortunately, there aren’t regulations as of now). Shading/Brow Stippling- Shading can be done by hand or machine. I love both for their different effects. Shading or stippling effects can be transparent like using watercolor or it can be more solid. Most natural will be a semi-transparent application that creates a shadow of color. The key to a great brow is blending the shading with strokes which results in a more natural, fuller brow than any stand-alone technique; hence Blended Brows™. The idea behind Blended Brows™ is dimension, movement, and volume. Each technique and different needle configuration I choose delivers just that. My eyes see every brow as a new canvas and no two clients will end up with the same cookie cutter type of brows. Most clients want natural and many prefer not to wear much eyebrow makeup. Some clients don’t mind wearing makeup and just want a light brow guide to follow. Don’t get too confused…as your Brow Artist, I will help decide what will look best with your skin type, fit your lifestyle and what techniques I will use to create Blended Brows™.